“Hey, you two!” A fleshy, bespectacled guy glared at us from behind the counter. “If all you’re gonna do is stand there shooting the bull.” …I was totally convinced we were about to be thrown right back out of the delicatessen we’d only just entered and for what – talking?… “The least you could do is put this away.” The guy’s feigned glare melted into innocence as he held out a shopping basket. While I put my eyes back in their sockets and closed my mouth, I saw the man wink at the next customer. ‘Welcome to Philadelphia,’ Dapper Dan said to me with a wry look and shrugged. 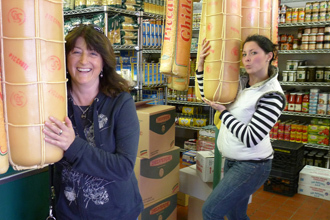 We had landed at Claudio, a foodie’s heaven in the center of the Italian Market. Its long service counter glistened with meats and cheeses; overhead, the ceiling bristled with panettone, sausages and even more cheese. Pastas, oils, crackers, preserves and all manner of Mediterranean delicacies filled the shelves. Customers clutched their bags and hungrily waited for service. From a few aisles over I heard the sound of my wife’s familiar laugh split the air. She and Emily from Cleanliness were shrieking over various jars, pulling them down in turn to examine tiny bits of black that nestled on the bottoms. Truffle oil, in all types and sizes. There was also truffle salt, truffle cream, preserved truffles in little cans. Yowza. During a brief lull in the crowd, the guys behind the counter were more than happy to show her. Before I knew what was happening, the one with the gold earring had taken the jar and, with a sparkle in his eyes, opened it. The aroma of truffle wafted out. Instantly, my mouth was watering. So began a fantastic sensory event. Truffle honey with goat’s cheese: a bit cloying, but certainly fragrant. He handed these over to us and watched our reactions carefully. Truffle honey with a salty pecorino: getting better. I walked a few steps away to look at the carciofi packed in oil with truffle lingering in my nose. ‘Him and him and she and her!’ We were called back to the counter, where a presentation on wax paper was in progress. The man drizzled truffle honey onto slices of Delice de Bourgogne, a triple cream French cheese. Reverently, he handed them around. How something so simple could be at once so complex: like harmonies of flavor playing on my tongue. The creamy softness gave way to layers of rich honey on the back of my palate over which was a high note, that of the truffle infusion, which crept up to nest in the sensory corners of my brain. Did angels ever sing more sweetly? And in an instant it was over. The guy with the earring cut a big wedge of cheese and wrapped it for the Salad Queen. The bulldog by the door almost smiled as we pretended to kiss the ginormous cheeses goodbye. Out on the street the sun settled in the afternoon sky. Back here in Seattle, the taste still lingers. I’ve found a few places to buy truffle honey, and any cheese merchant worth their salt can set you up with some excellent brie. Laid on crackers, the combination is a great start to an elegant meal. But I can’t guarantee you’ll find that shmear of ironic humor. To get that, you’ll just have to make your way down to the Italian Market. For a real Philadelphia experience. Flecks of Black Truffle give this Italian Honey an unmistakable flavor. Method: Put crackers or bread on plates, top with thin slices of cheese and drizzle with honey. Buying truffle honey: Truffle honey is available at Mediterranean specialty stores and at Williams Sonoma. Here in Seattle, I found truffle honey at DeLaurenti (1435 1st Avenue, www.dilaurenti.com) and Pear Delicatessen and Shoppe (1926 Pike Place), both in the Pike Place Market. In Philadelphia, it’s available at Claudio (924 South 9th Street, www.claudiofood.com) and at Di Bruno Bros. (930 South 9th Street, www.dibruno.com), both in the Italian Market south of South Street. Most brands are Italian imports and come in a 5 ounce jar. Restaurant Lulu in San Francisco (816 Folsom Street, www.restaurantlulu.com) makes and distributes a reasonably priced white truffle honey that comes in an 8 ounce jar. Buying brie: The best cheese for this is a triple-cream brie which is mature but not overripe. While I loved the Delice de Bourgogne at Claudio, the same cheese here is generally so liquid as to be unsliceable. If you have a good source for this cheese, go for it. The folks in the cheese department at my local Wholefoods recommend Cremeaux de Bourgogne as an alternative to Delice de Bourgogne. Here at Chez Bullhog, we often fall back on St. André. It’s reliable and tasty, and I’ve never had any difficulty slicing it. Crackers or bread: Carr’s water biscuits are our favorite platform for this appetizer. A baguette is good, too, but I’d pass on any but the freshest. Slice at an angle for best results. Wine pairing: Prosecco every time. Saluté! 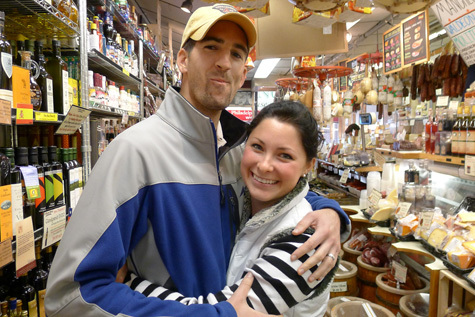 Dapper Dan and Emily from Cleanliness down the street at Di Bruno Bros.
Lord gawd. I’m even imagining licking the sticky gooey from between my fingers. And the headiness of this taste experience. Wow. I’m very jealous of your easy access to DeLaurenti. It’s a must when I’m in Seattle, which is not nearly often enough. Thanks for this reminder that simple is amazing when dealing with top-o-the-line ingredients. Mmmm. Glad you had such a great time, say hi to Emily for me! Truffle honey?!?!?!? I’ve never heard of such a thing! BUT, I want some! What a great time was had! I’m so glad to see this posted. We went back and got the truffle honey, too! I cannot wait to be back on the East coast for reasons such as that honey. YOU HAD ME AT TRUFFLE HONEY! Yum! My mouth is watering!!! Brie is my favorite cheese, and I LOVE having wine and cheese combined with water crackers and honey…best treat ever! What a fun post! Oh, my gosh…I’ll be looking for truffle honey in Indy…but have a feeling it will be a long, fruitless search. I’ll keep dreaming that I may locate some. This is the kind of experience that makes travel all worth while Don. No truffle honey in my cupboard or planned trips to Philly but you never know where I might come across this delicacy. We need to ask at La Buona Tavola at Pike Place Market. La Buona Tavola does indeed carry truffle honey in your choice of white or black truffles, both imported from Italy. As the building where La Buona Tavola is housed at the Pike Place Market is currently being retrofitted for earthquake compliance, it took some looking but we found them in temporary quarters in the main market across from the arcade. Stop by for a sample! 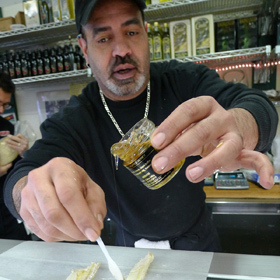 Truffle Honey and this market are going to the top of my list to eat and to visit! That looks absolutely amazing. I can only imagine the heavenly combination of sweet, syrupy honey with that brie. Mmmmmmm. Congratulations on making it to Top 9 on Foodbuzz! I love the sound of the word truffle, along with all the decadence it conjures up, but I actually don’t like the taste of it. I know – that puts me squarely in the bizarro-minority of foodies! Still, ‘truffle honey’ sounds amazing. How is it made? Oh.my.goodness. I’m salivating over here. We like St. Andre brie as well. Slices and tastes wonderful. I have never tried truffle honey – I am on the hunt now! You are a talented storyteller as well! Yum, I need that cheese ! I also use MarDona’s truffle sea salts, truffle oils, dried truffles, truffle mayonaisse, and truffle mustard! I’ve never heard of truffle honey nor the market, however I’m thinking I would be a great fan of both!! Love the story that goes with the flavors. Congrats on the Top 9 too! Wow, that looks awesome. I’ve never thought of putting honey with brie before…yummmm! 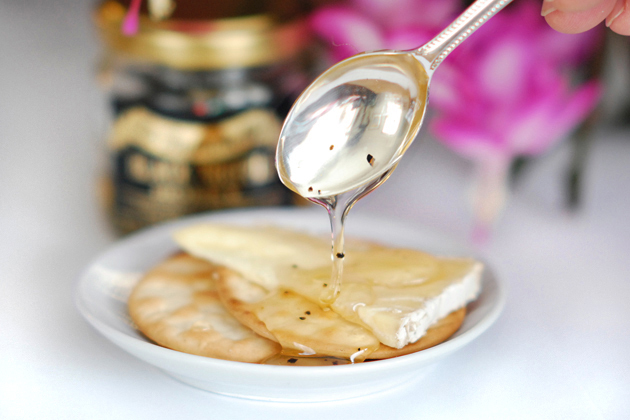 Wow, a truffle honey over brie sounds heavenly indeed!